Click below to go to our interactive map of agricultural projects. In North Carolina, hog farming is one of the largest agricultural industries. Conventionally grown hogs are raised on concrete as a way to increase feed efficiency and increase output. Alternatively, the “old way” of raising hogs on the ground allows pigs to be grown outside, improving meat quality and reducing environmental impact. 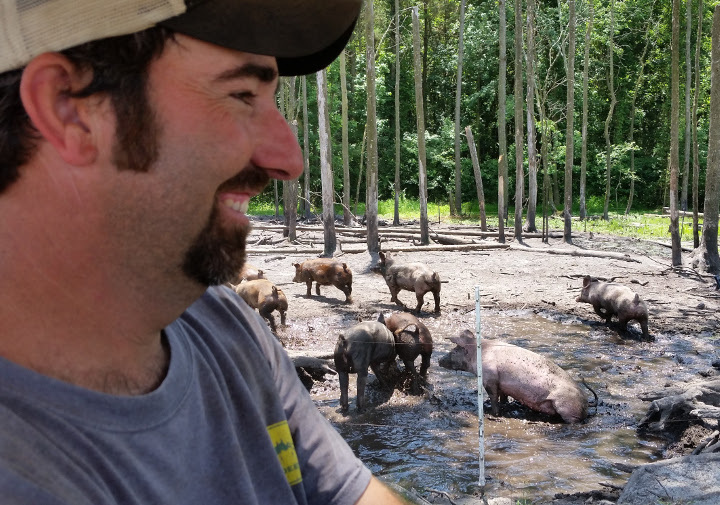 In the eastern part of the state, the North Carolina Natural Hog Growers Association (NCNHGA) is reviving this type of production to answer the growing market demand for more humanely raised animals fed with non-GMO grains. 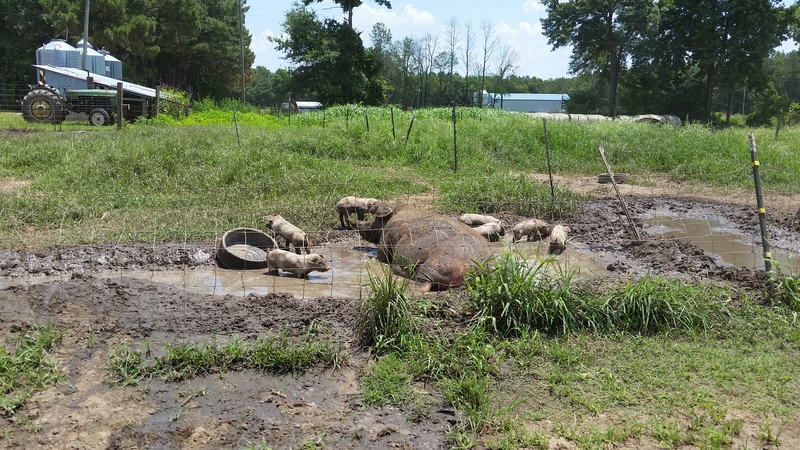 A sow and piglets keep cool the natural way by wallowing in a muddy bath. With Whole Foods’ new plan to label all GMO-containing products, the NCNHGA saw an opportunity to gain a market advantage and cater to consumer demand for non-GMO products. In 2015, the Association was awarded an Agricultural Reinvestment Fund grant to help its members become non-GMO certified. 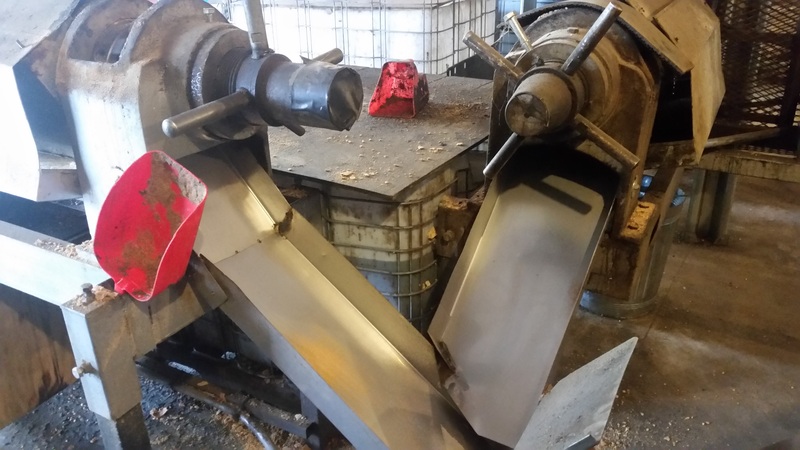 With the grant, the Association installed a second soybean oil press, a grain bin, and materials to test for GMO contamination in their crops. After processing, the roasted and dehydrated non-GMO soybeans are fed to the hogs as supplemental feed. Obtaining a non-GMO certification can be a somewhat long and, at times, tricky process for farmers. Grains cannot test for greater than 0.9% contamination but pass through many different hands on their way to the hog trough. To mitigate this problem, the Association controls their risk of contamination by growing their own grain for hog feed. 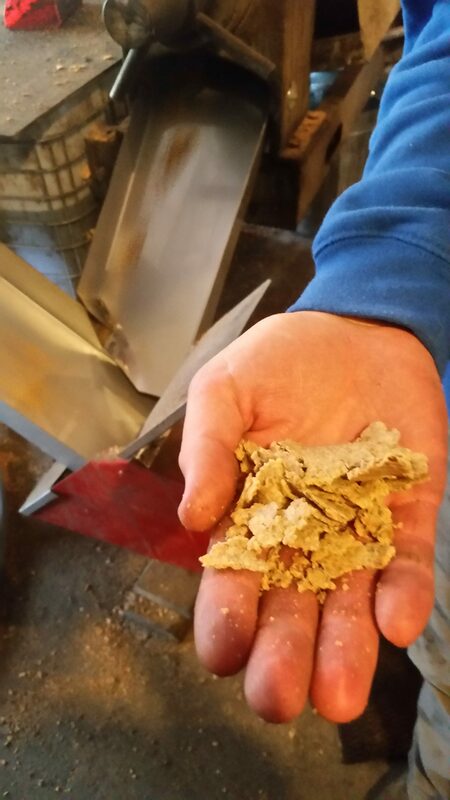 They press their own soybeans in the oil press, and the by-product is a flaky material that is fed to the hogs as a supplement. The oil can be sold as non-GMO soybean oil to a refinery where it can be made into a food grade product or used for a variety of other applications. Currently, the Association’s primary customers are Firsthand Foods, Whole Foods, and The Pit in Raleigh, NC. Customers will one day see the pork packaging from these outlets include a non-GMO certification thanks in part to the Agricultural Reinvestment Fund and the hard work of the Association’s farmer members. The Agricultural Reinvestment Fund, which awarded a grant to the NCNGHA, is supported by the NC Tobacco Trust Fund Commission.